Technology / Solution | Soldering robot - robot soldering - COSMIC CORP.
Soldering for retrofit parts has problems such as solder bridging, solder ball spattering and cold solder so that stabilizing of soldering quality is difficult. 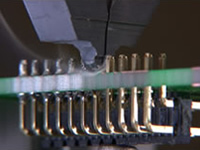 7 Advantages of the Cosmic Automated Point Soldering Robot System. To solve these problems, Cosmic invented “Cut and Solder System” of PSU500 Automated Point Soldering Robot System. because the heat to melt solder and the heat to be transferred to parts will be changed. The “cut and solder” system of the PSU500 has solved it as follows. at soldering consecutively and for the parts which has big heat loss. When soldering with a metal soldering iron tip, the shape of the tip changing by oxidization and solder leaching are not avoidable. 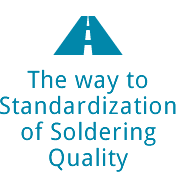 for standardizing and stabilizing soldering. The PSU500 can support lead-free and silver-free solder, requiring no nitrogen gas. because our PSU500 uses the high-temperature heaters. 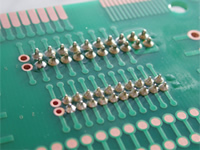 The soldering tip uses ceramics, not metal, therefore, long life. 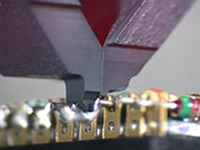 The cut system stabilizes the solder amount and no waste. The high-power heaters that quickly raise temperature stabilize the heat. Soldering method has been all digitized. Almost no solder balls and flux spattering. It contributes soldering time to be shorter.